The duo bag the senior titles as Rory Leonard and Amelia Quirk win junior crowns at Harewood House. 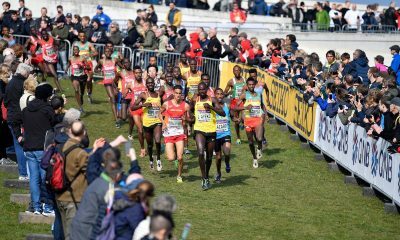 Southampton AC’s Mahamed Mahamed won an exhilarating sprint finish against Leed City’s Emile Cairess while Aldershot’s Emily Hosker-Thornhill was a clear winner in the senior women’s event at the English National Cross Country Championships on Saturday (February 23). 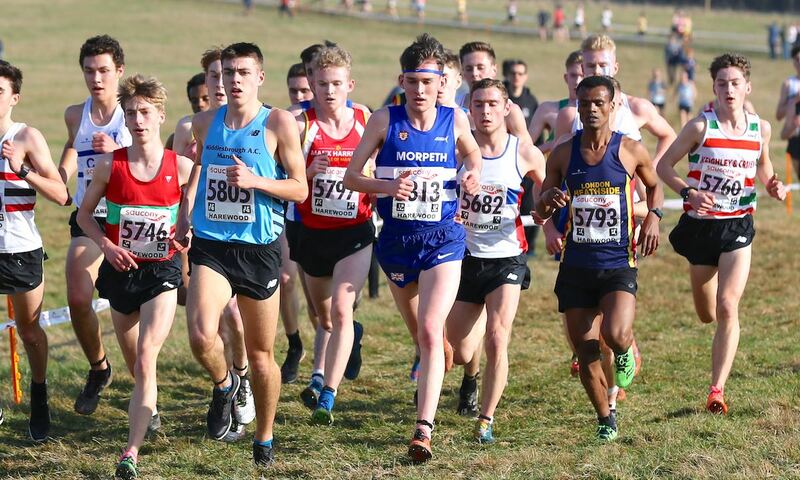 There was excellent racing across the board, from junior to senior levels, with over 8000 runners entered at the Harewood House Estate hosted championships. 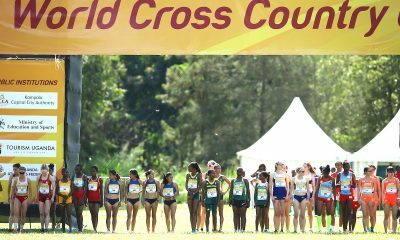 This year’s championships was the 131st edition of the senior men’s event, while the senior women raced for the 86th time. 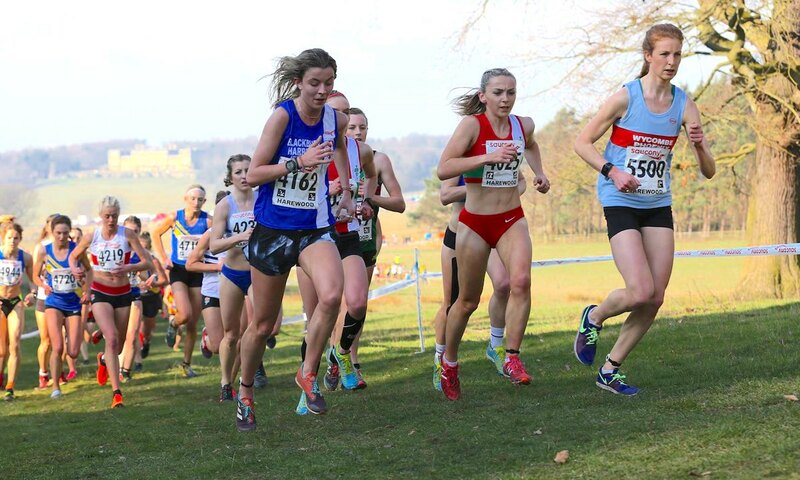 In the senior women’s race, AFD’s Emily Hosker-Thornhill was eleven seconds clear of Phillipa Woolven of Wycombe Phoenix Harriers and a further 30 seconds in front of Blackburn Harrier Jess Judd. The Mick Woods coached athlete took 28:17 to cover the eight kilometre distance and builds on a solid cross country season so far with strong performances at Great Stirling Cross and the British Cross Challenge in Northern Ireland. 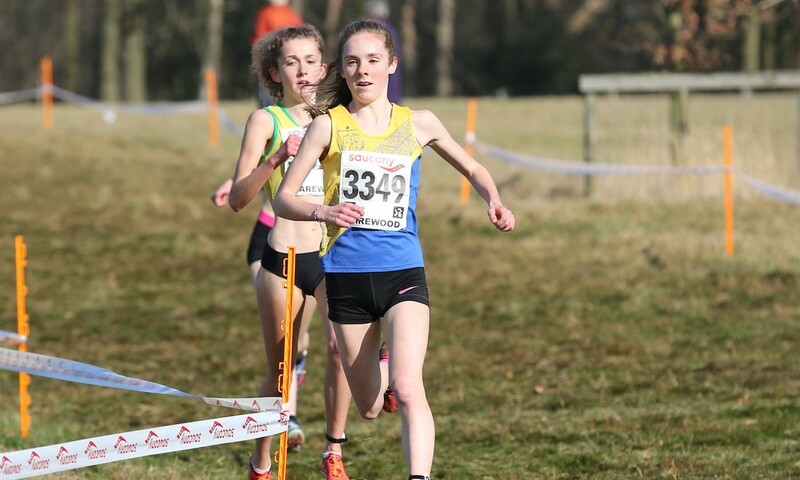 Pippa Woolven was coming off an excellent victory at the highly competitive Southern cross country championships and was likely the favourite on the startline, while Blackburn’s Judd had a host of impressive performances on road and cross country in recent months. Sale Harriers’ Georgia Taylor-Brown was next across the finish line ahead of Aldershot’s Louise Small to complete the top five. Claire Duck in sixth and Lucy Crookes in 10th place led Leeds City to the top team prize ahead of Aldershot and City of Norwich. 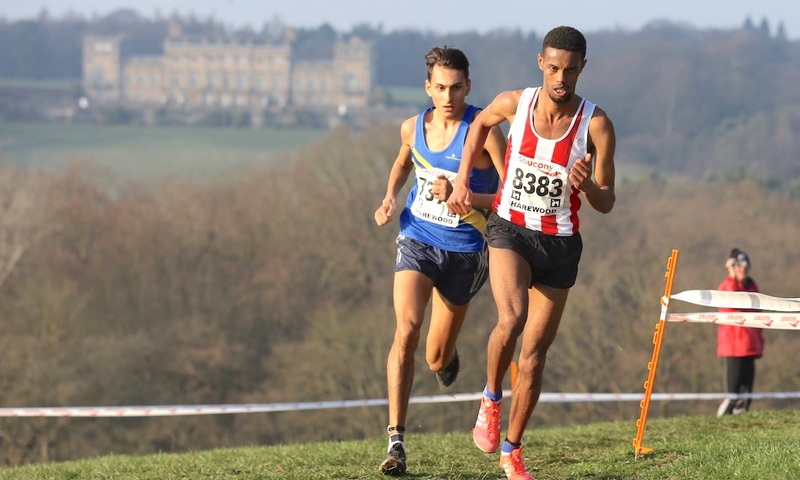 Despite getting some excellent sprint finish training against Patrick Dever at the BUCS cross country champs earlier this year, Emile Cairess didn’t have the answers when Mahamed Mahamed surged ahead to the finish line in the senior men’s championship race. The young Southampton AC runner excels on the country and has raced a couple of times overseas before this weekend and focused on some speed at the BUCS indoor 3000m champs. His winning time was 36:34 for the 12 kilometre distance. Leeds City’s Cairess has been in prolific form and posted wins at the Northern champs, as well as BUCS and the Yorkshire county championships. It wasn’t to be on the day and the speedster will have to settle for another fine second position at the English showcase winter event. Morpeth’s Carl Avery was third on the day, one place behind Cairess as he was at the Northern counties earlier in the year. 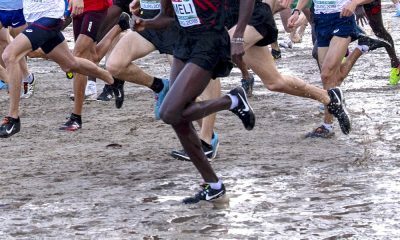 Ipswich Harriers’ John Millar finished fourth, while 2018 champion Adam Hickey completed the top five. Cairess’ performance and Graham Rush in 10th place led Leeds City to team gold ahead of 2018 champions Tonbridge, with Bristol & West securing bronze. Amelia Quirk continued a great start to 2019 with a win from Jessica Mitchell and Grace Brock. All three runners featured in the top six at the southern championships, where Quirk also came out on top. Havering’s Mitchell went from sixth at the southern’s to overtaking Cornwall’s youngster Brock for second. Herne Hill Harriers won a close team competition over Aldershot, while Basingstoke & Mid Hants took bronze. Morpeth’s Rory Leonard followed on from victory at the Northern counties championships with a national title. The promising youngster also had an excellent outing at the Cross Internacional Juan Muguerza at the start of January so his top notch win wasn’t unexpected. Second place was Nathan Dunn of Preston Harriers and third went to Jeremy Dempsey of Shaftesbury and Barnet. Tonbridge AC won the team gold ahead of Cambridge & Coleridge, with Reading AC taking bronze. Samuel Charlton was U17 champion at Harewood House, with the Wallsend Harriers & AC athlete taking the gold in 18:48, 11 seconds clear of AFD’s Will Barnicoat and Henry McLuckie of Shaftesbury & Barnet. In the U17 women’s race, it was Olivia Grace Mason who finished just under 18 minutes for the 5km distance to take the gold medal. 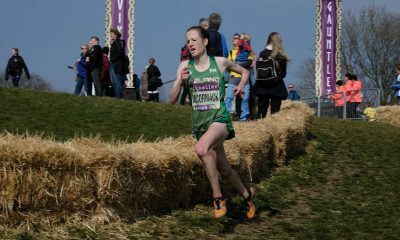 The Border Harrier beat India Pentland of Darlington Harriers & AC, as well as Charlotte Alexander of Herne Hill Harriers. Vale Royal’s Holly Weedall took the honours ahead of early leader Kiya Dee of Highworth, who finished second, and third-placed Indienne King of Wreake & Soar Valley. Wharf dale Harrier Alexander Thompson took the honours in the boy’s race, ahead of Louis Small of Ashford AC and Matthew Taylor of Tonbridge AC. The two southern athletes pipped to the post by the northern Wharfdale runner. Scarlet Livingstone of Exeter Harriers was first across the line in the U13 girls event. Wolverhampton & Bilston’s Zoe Gilbody and Woodford Green AC with Essex Ladies’ Abigail Reid was third. Ben Peck, William Rabjohns and Alex Adams were the trio at the front of the boys race. Peck, of Thetford AC, was also south of England champion in January this year.